My partner loves the t shirts and jumpers i get from Jacamo. Especially the Joe Brown's range of T shirts. They offer bigger sizes for all shapes. My partner is quite tall and finds normal shops don't have long enough sleeves or long enough in the torso. 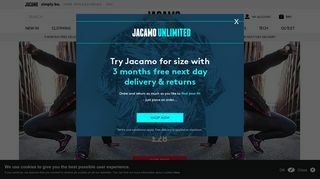 Jacamo have the perfect sizes and are reasonably priced. What a great service after walking around town for 2 hours trying to find some suit trousers just to find out i am too fat for anything in town. Then after a Google search Jacamo comes up i couldn't believe the incredible prices and free delivery on a Sunday i am not going to bother with town now. If your slightly overweight or big built then Jacamo is for you. I highly recommend them.